India’s longstanding opener Rohit Sharma is just 46 runs away from reaching 8000 runs in international cricket, which will make him the 31st player to reach the landmark. Its been a landmark series for Indian vice captain, who during the third ODI, became the fastest to smash 350 sixes in international cricket. 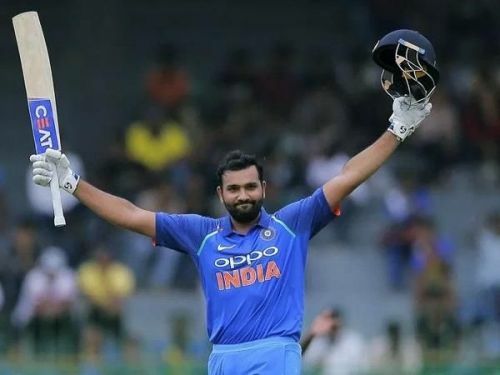 Ever since he became an opener in 2013, Rohit Sharma has grown to become one of the most explosive batsman in world cricket, as he currently averages 47.34 in ODI cricket at a strike rate of 88.20. His ability to construct a long innings in ODI cricket has resulted in three double centuries, with two of them coming against Sri Lanka. He made a stroke-filled 95 in the last ODI at Mohali and looks set to cross the 8000-run mark in the next ODI at Delhi. Eight Indian cricketers have crossed the 8000-run landmark until now, which is the most by any national team. The last person to achieve the milestone from India was Virat Kohli, who went past the landmark in 175 innings. If Rohit Sharma scores 46 runs in the Delhi ODI, he will be the 3rd joint-fastest to 8000 runs, along with Sourav Ganguly. Sharma is currently ranked second in the ODI rankings and since the 2015 World Cup, he is the second-highest run scorer in ODI cricket after Virat Kohli. The elegant stroke-maker reached the 7000-run mark on 23 september 2018 in 181 innings and since then he has amassed 956 runs in just 18 innings. At this rate, he will go past the 10000-run landmark in ODI cricket with ease. If Rohit fails to reach the landmark in the next ODI at Delhi later today, he will have to wait until June 5, when India take on South Africa in the World Cup.